I sent my two ewe lambs to Maryland this year w/ my son and daughter-in-law as they were going down from New Hampshire with two Romney groups (black and white). This was the first time that I had lambs early enough and good enough (I thought) to show there. One ewe lamb was out of a natural colored ewe I’d purchased at Rhinebeck in 2012 from Margaret Van Camp (Pitchfork breeding), the other was out of an older natural colored ewe of my own (generations of Ward). Both ewe lambs were white, and sired by my ram from Robina Koenig (in 2011, Carry House & Koenig). 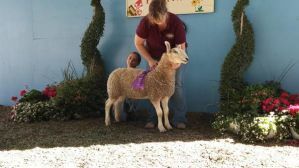 I’m sending you the only picture I have of the Koenig/Pitchfork ewe lamb who was first in her class and was awarded Best Fleece in the Bluefaced show. 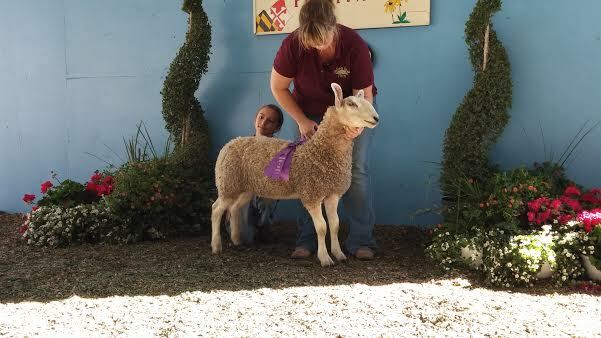 My other ewe lamb was second in the class. Can you believe that I was home in NH while my sheep were doing so well in Maryland? Have to thank the team of Dr. Wes and Ms. Hilary Chapin for presenting these lambs at their best – and the breeders whose sheep gave me a great match in genetics. What a thrill! And, if you’ll notice, my granddaughter, Ellora, was assisting in the photo shoot. Ellie now has three of her very own Bluefaced Leicesters.